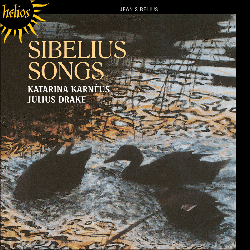 Sibelius’s songs have taken a long time to come in from the cold. After all, the few that are relatively well-known (Black roses and Op 37 No 5, ‘The Tryst’) are passionate enough to have come from Italian opera, and others which over the years have found a place in the repertoire have a span of phrase and a melodic surge that encourage the voice to rise thrillingly, as in ‘The Tryst’s’ predecessor, ‘Was it a dream?’. The tingle of a Nordic chill in among this is in fact a further excitement of the blood. Given a voice that can combine the sparkle of sunlight on snow with the dark splendour which lies at the heart of those black roses, an entire programme of Sibelius’s songs offers not an austere pleasure but almost a rich indulgence. But from both singer and pianist there must also be a ready supply of imagination. Katarina Karnéus and Julius Drake answer these calls magnificently. The voice is firm and resonant, purest in quality in the upper D-to-F region and of ample range. In Julius Drake she has a pianist who extends the normal field of vision, and the two work together to great effect. In the opening song, To evening (‘Illalle’), Karnéus and Drake ‘build’ the verses with such effective graduations of power and intensity that everything is enhanced – the vocal line, the piano’s tremolandos, words, mood, the poem-aspainting, the song as miniature epic. In some others – ‘Little Lasse’ in Op 37 and the remarkable ‘Tennis in Trianon’ of Op 36 are examples – von Otter and Bengt Forsberg bring a further sophistication, more rightfully placed in the second example than the first. But if you want a single disc of 25 to to represent Sibelius’s output of roughly 100 songs then this disc must take first choice.